Six Questions. True or False. Can you answer each one correctly? 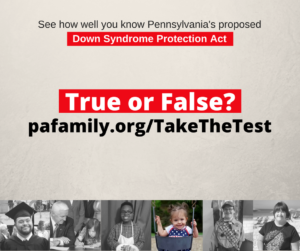 Pennsylvania’s proposed Down Syndrome Protection Act – House Bill 2050 – is about to be voted on in the Pennsylvania House of Representatives. Do you think you know what this act would do? Take the test and find out – click here to get started.